I am not quite sure why a made my last post a cliff hanger. To tell you the truth, I was running out of time and decided to just cut the post in two parts. The machine is rather simple and mine is geared to affiliate marketing, but I will explain it so that you can create one for just about any topic or industry. Now I now there will be questions about spam whenever any sort of automation enters the conversation. Spam is how you cook it. This Twitter account I actually use. The automation is there because I don't use it as often as I would want to. It picks up the slack when I am away. Not everyone can start with celebrity and gain 1,000,000 Twitter followers by osmosis. People like to follow others that tweet about content they are interested in. You want the amount of people you follow to not be too much higher than those that you are following. The most active Twitter users are either new or addicted. Tweeting links related to your topic that aren't your own is altruistic...on the surface and spreads new knowledge to the people following you. My focus on this account is affiliate marketing, like I said. So first I found a lot of blogs that I trusted to have great posts on the topic. I actually already had all of these in my feed reader. So I took these feeds, created a category in Feedhub and added them to a hub. Once I had these feeds waiting and ready, I created a twitterfeed account attached to my digireviews Twitter account. Twitterfeed uses OpenID for logins, so I also created a Google account first. It is a good thing to have a Gmail account attached to each various blog and "persona" you may have. I may be Stephan Miller on this other blog also and cover similar topics but I do so from another angle. There are many reasons for this, but the reason I will use now is that I can only used one Twitter account with one twitterfeed login. So after creating the account, step 2 is now adding the feed I created in Feedhub to twitterfeed. I also added the feeds from two of my blogs to the same twitterfeed account. I guess I could have added all the feeds I added to Feedhub one by one at this point rather than adding the extra, but Feedhub has a filtering processes that picks the top posts from the feeds rather than every single post. It also tracks clicks on the feed links to improve these choices. I figured it would cut down on noise and improve the tweets over time. Now is this all I did. Of course not. This was to make my Twitter account active when I was not and I found myself actually checking the account to see what I tweeted and reading the posts that were. Next I created an account with Tweetlater. 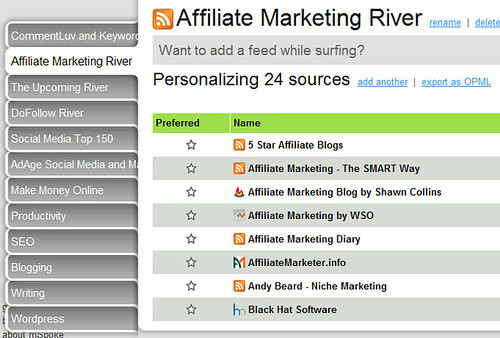 This allowed me automate specific tweets like affiliate products I was promoting and send automated DM's to people. Now some people hate automated DM's but it all depends on the industry. My automated DM sent new followers to my blog to subscribe and hopefully while subscribing they noticed I was giving a free Wordpress plugin that ads Clickbank hopads to each post. And in order for them to get it, they had to subscribe to my list. You see there is more too this machine than Twitter and I always like killing as many birds with one stone as I can, pun intended. This part was easy but it involves a lot of grunt work. First you must imagine who your perfect followers would be following now. In affiliate marketing, I went for affiliate marketers that had a lot of followers and also for the Twitter accounts of affiliate programs like Clickbank. And I went through and followed about 200 a day, give or take and some days I just did not have the time. But you never really want the count of people you follow to get much higher than the count of those following you. So every two to three days, I went in and unfollowed people who didn't follow me back. There are some tools to help you do this out there, of course like Friend or Follow, Twitterless and Less Friends. There is a another process you can use for this that takes a bit longer but you will have much more targeted and receptive group of followers. Search twitter for "first tweet" and then check each person's bio and website. Then just follow those people who seem to fit the demographic for your niche. Of course, you can also just use Twitter search to find the people who might be interested in what your account has to offer just by searching for specific terms related to your topic or niche. And these tools may help: WeFollow, Just Tweet It, Twitterator (when you happen to find a list of good people to follow), Twubble, Who Should I Follow? and Mr.Tweet. This is not meant to be a set it and forget it account. I am active on it almost every day. Finding new things, making observations and retweeting other's tweets. But after having my first account, I realized that to build a targeted one and to build it faster, you have to be proactive. My personal account here will remain what it is, but I needed something more for my affiliate marketing Twitter account. Everyone with a blog makes lists and unfortunately this leaves you with a lot of tools that you have no idea how to use efficiently until you have time to investigate them all. What I do with these lists is find out how to make these tools work together for a purpose. It's the difference between features and benefits. People are out looking for the benefits. And everyone is writing about features. This process is relatively simple and my listing of useful tools may have made it more confusing than it needs to be, so here are the basics. Find people who you think would want to follow you and follow them. Find some useful feeds you trust to have good material and tweet them automatically. 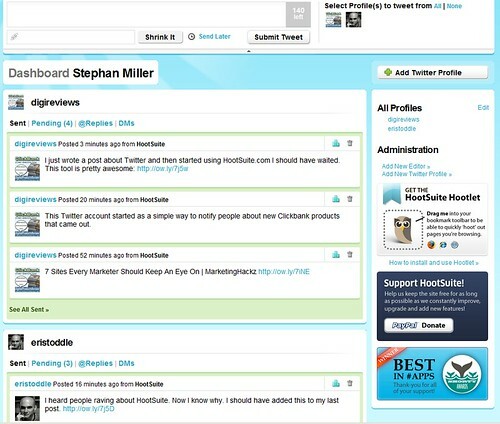 Set up your own automated tweets for specific marketing reasons. Use the time you saved to be real as you would with any Twitter account. I was going to add this as a comment, but I thought this would be better. I have had a HootSuite account for a while and just had a chance to try it right after publishing this post. This tool is awesome. 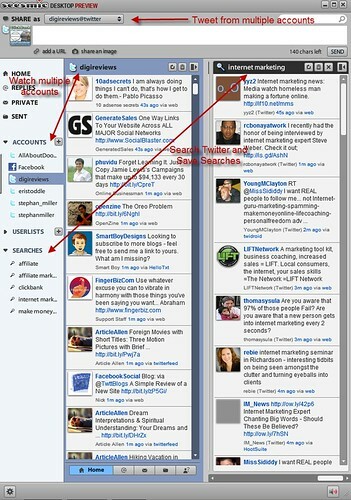 You can schedule tweets with it, control multiple Twitter accounts and post to multiple Twitter accounts.